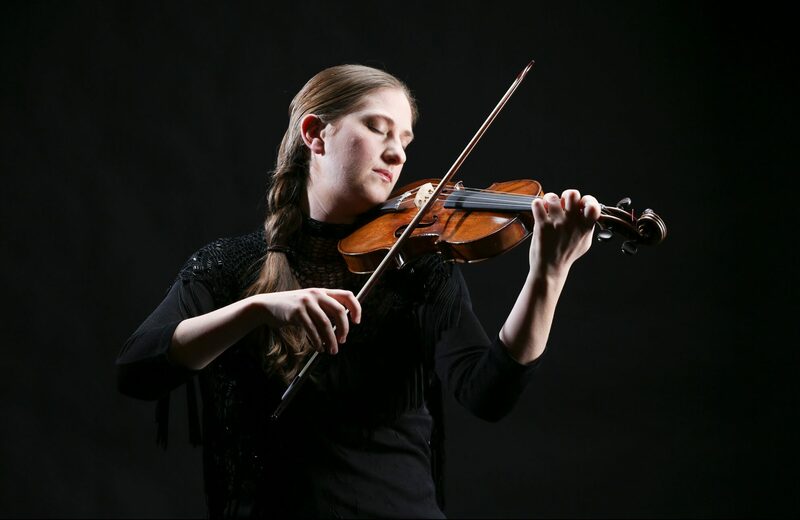 Christina Day Martinson is the soloist in Biber’s Mystery Sonatas. 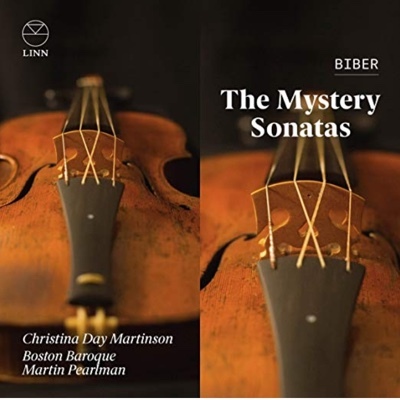 Canadian-born violinist Christina Day Martinson and Boston Baroque have released a two-CD set on the Linn label featuring luminous performances of Heinrich Ignaz Franz Biber’s 15 short Mystery Sonatas for violin and continuo (plus an unaccompanied passacaglia), probably written in the 1670s, but unknown to modern ears until they were first published in 1905. The title page of the unique, beautifully written manuscript in the Bavarian State Library that preserves these works has gone missing, so we don’t know what the Austro-Bohemian composer himself called them. But because the collection corresponds to the medieval devotional practice of the Fifteen Mysteries of the Rosary, the work is commonly referred to as the Rosary (Rosenkranz) Sonatas. 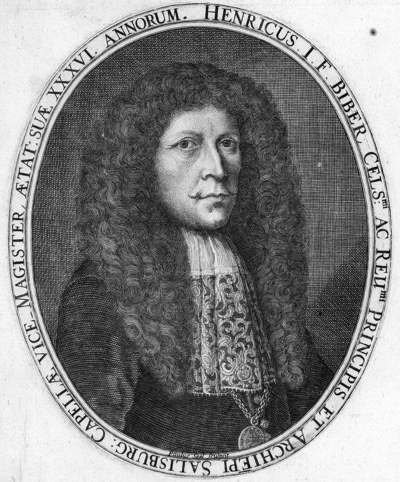 The manuscript carries a dedication to Biber’s employer, Max Gandolf von Kuenburg, Archbishop of Salzburg from 1668 to 1687, who belonged to a Confraternity of the Rosary. Like the Stations of the Cross, the Rosary ritual involves processing between 15 statues or paintings depicting the five Joyful Mysteries, the five Sorrowful Mysteries and the five Glorious Mysteries of the life of Christ, counting them out on beads. In the manuscript, little copper engravings appear at the top of each piece, illustrating the subject matter. Biber’s pieces could accompany such a devotional perambulation, but they work just as well as a stationary meditation. Setup of the violin is an important feature of the collection. While the instrument is tuned in normal fashion (G, D, A, E) for the first Mystery and the final passacaglia, the other fourteen each come with their own special scordatura, notated at the beginning of the staff, which create subtle color changes appropriate to the subject at hand as individual strings are tightened or loosened. Although the violin part is virtuosic, Biber stayed true to the devotional intent of the collection and resisted the temptation to paint events in Christ’s life and passion in overly vivid colors. Achieving a wide range of hues in her tone, Martinson plays the expressive pieces flawlessly, sensitively supported by her Boston Baroque colleagues — harpsichordist, organist, and artistic director Martin Pearlman, theorboist and guitarist Michael Leopold, and cellist Michael Unterman. Left alone for the concluding Passacaglia, Martinson shows why this piece has been regarded as the greatest unaccompanied violin work before Johann Sebastian Bach took his pen to the form. 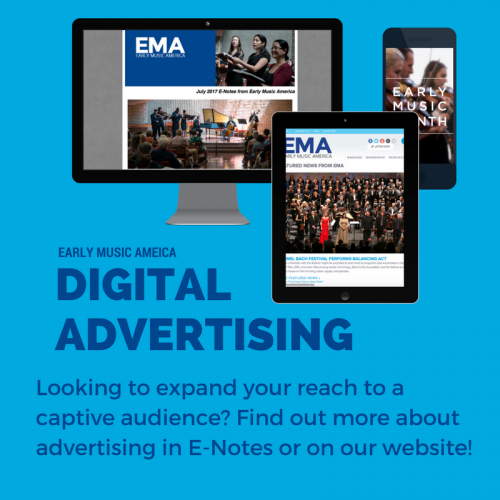 Recorded over the period of a week in March 2017, the disc was produced with the expert collaboration of Cleveland’s Five/Four Productions — Thomas C. Moore, recording producer and editor, and Michael Bishop, recording, mix, and mastering engineer. The sound quality of these first-rate performances is clear, vivid, and present. Daniel Hathaway founded ClevelandClassical.com after three decades as music director at Cleveland’s Trinity Cathedral. He studied historical musicology at Harvard College and Princeton University, and orchestral conducting at Tanglewood, and team-teaches Music Criticism at the Oberlin Conservatory of Music.